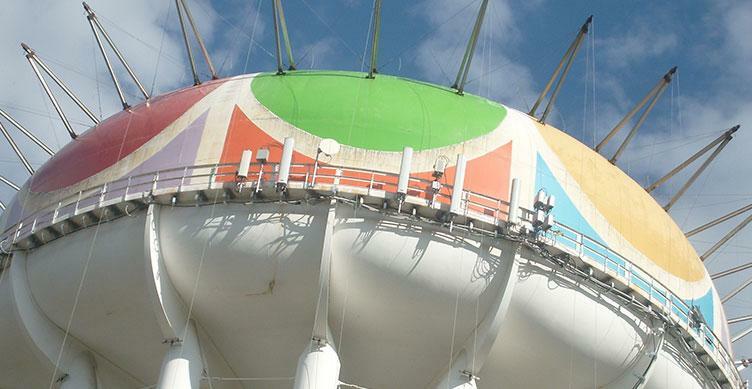 Thomas Industrial Coatings crews are currently teaming up with the Kansas City, Missouri Water Services Department on a water tower painting job involving three tanks, totaling 2.8-million gallons of water storage space for the city. The Worlds of Fun amusement park logo is to be added to the largest tank, which has a 2-million gallon capacity. As crews began work on the largest tank, it became apparent the internal structure had badly deteriorated. At nearly 50 years old, the tank was showing signs of its age. When the surface struggled to stand up to an abrasive blast, it was decided that a full-scale interior overhaul was needed. Luckily, the team was able to consult with Kansas City officials, as well as structural engineers that had previously worked with Thomas Industrial Coatings. The contract was eventually reworked to accommodate the extended scope of the water tower painting job. A full scaffolding system was erected inside the tank so that no portion of the restoration was out of arm’s reach of the crew. This was an operation significantly more in depth than the safety staging required by a simple abrasive blast and coating. In the end, this added step guaranteed that Thomas was providing Kansas City with a lasting fix, rather than pushing necessary maintenance further down the line. The tank’s age also meant that its exterior could not support another top coat. Instead, it would have to be blasted with an abrasive before the outer coat could be added. As another consequence of the tank’s age, crews were dealing with a lead-based paint and had to take measures to prevent hazardous materials from escaping into the surrounding environment. With outriggers in place, crews erected a “teepee system” to completely enclose the tank. As a large painting contractor, Thomas Industrial Coatings has the resources for a total containment job readily available. Crews will wait until spring to begin work on the 115-foot Worlds of Fun logo that will adorn the revamped tower. The urethane top coat is sensitive to cold weather, so it will be applied in warmer temperatures for the best effect. The project is expected to be completed by early May.